product of over thirty years of constant improvement. Extremely satisfied customers have provided rave reviews. LicenseTrack™ has been designed to support your licensing needs well into the future. LicenseTrack™ is truly the Ultimate Licensing System as it allows flexibility previously thought impossible for issuance and maintenance of virtually any type of license. Minimized costs—Automation and Electronic Issuance reduce the costs associated with issuing business licenses. Recovered revenue—Discover who may have previously fallen through the cracks. The automation of delinquency, invoicing, and receivables processing can yield previously undiscovered revenue. 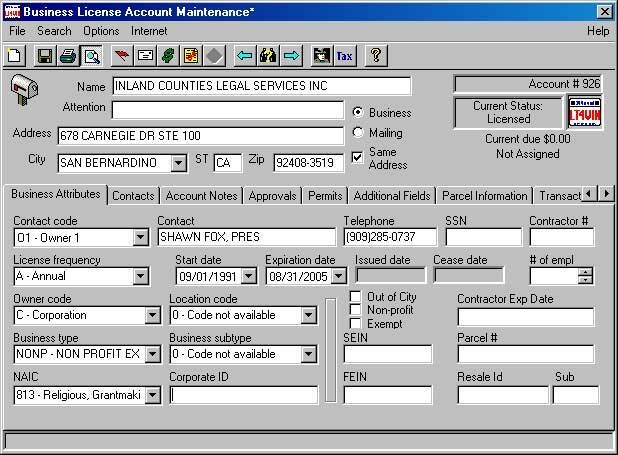 LicenseTrack™ Business License Software has been designed from start to finish with the end-user in mind, providing real time address validation, enhanced departmental approval processing, user customizable fields/labels, notes for contacts as well as user customizable reports (via Crystal Reports™). LicenseTrack™ features Integrated Tax Forms, restoring a refreshing sense of efficiency to licensing tasks. For the end-user, this means the ability to apply taxes is readily accessible, often little more than a click away. Besides qualifying you for postal discounts the optional CASS certification data (updated every two months) you are provided with additional information such as congressional district, longitude, latitude and more. Each of these fields can be used for ad hoc reporting. 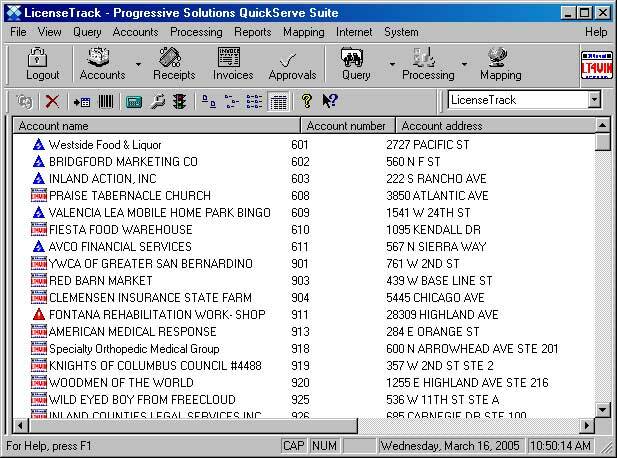 LicenseTrack™ can pass this information to ESRI or other mapping systems to generate geographic maps. Parcel information will be available on-line to subscribers of Experion assessor information. In addition, phone numbers may be verified against a set of digital yellow pages, that contain just the businesses within your city. LicenseTrack™ is a true client server application. It is written using C# / C++ to obtain maximum speed and flexibility possible. LicenseTrack™ complies with the Open Database Connectivity (ODBC) technology that allows LicenseTrack™ to utilize any ODBC compliant database. It is designed for single-user, network and remote environments. Our systems are designed to run on reasonably new Windows® systems. An ODBC compliant database system is required. Often, this means a Windows® server with MS Sql.